MONTREAL - The Bloc Quebecois MP who was expelled from caucus for deriding Quebec's proposed charter of values is questioning her future in the independence movement. "Do people like myself who come from elsewhere, who integrate themselves into Quebec society, who become full-fledged citizens, do they have a place in the independence movement?" Maria Mourani told a news conference Friday. Mourani, who was born in Ivory Coast and is of Lebanese origin, admits she doesn't know the answer to that specific question. She made it clear, however, she has serious reservations about the current state of the sovereigntist movement. "Over the years I have noticed the existence of tension within the independence movement," said Mourani, who was wearing a cross as she normally does. "But the movement's leaders and its majority were always able to chase away the demons of populist intolerance when it came time to draft policy. Now I'm asking myself if those days are gone." Mourani, 44, was outspoken this week in her criticism of the Parti Quebecois government's plan to forbid Quebec's public employees from wearing conspicuously visible religious symbols — including hijabs, turbans, yarmulkes and larger-than-average crucifixes. She warned the values charter would create systemic discrimination, especially against women, and that it would hurt the sovereigntist cause. That prompted Bloc Leader Daniel Paille to dismiss her from caucus on Thursday. 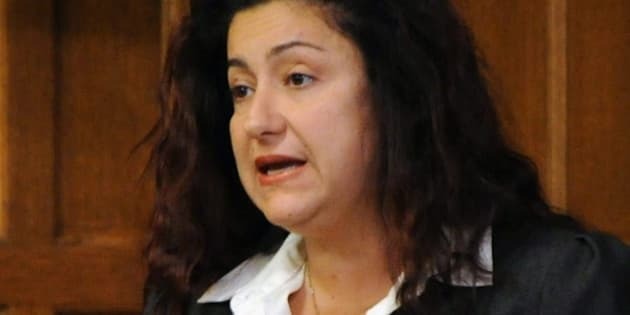 Mourani, who has quit the Bloc and will sit as an Independent MP in Ahuntsic at least until the 2015 federal election, stuck to her guns Friday. "Firing women from daycare centres because they're wearing a cross or a scarf, or a man from a hospital because he's wearing a kippa or a turban, I can't adhere to such a policy," she told the news conference. Mourani said she is extremely saddened by the turn of events as she reiterated her criticism of the proposed charter. "Was my expulsion from the Bloc the conclusion of a succession of events in which an election-driven strategy took precedence over the defence of basic human rights? I wonder." Polls have suggested a majority of Quebecers support restricting minority accommodations. However, other surveys indicate voters place the issue relatively low on the list of political topics they care about. Some pundits are speculating the PQ might try to drag out the charter debate to make Quebec's identity — and not other issues, like the economy or social services — the heart of the next election campaign. The charter is likelier to be more popular in outlying regions of the province where there are more small-c conservatives. That's where the now-defunct Action democratique du Quebec garnered much of its support in 2007 as it surged to official Opposition status after it campaigned extensively against minority accommodations. Mourani said her family could have gone to live in France but chose Quebec instead because it was free of the identity tensions she said existed and still exist in France. On Thursday, Marois rejected the idea that the charter would put the brakes on francophone Muslims moving to Quebec and said France is the "best example" of that. "France, which has a very high number of residents of North African extraction, has found a way to live with all these people who have other religions," Marois said. Mourani also said that when she reads Canadian newspapers, "it's evident that in terms of being inclusive, Quebec's image takes a dive." "But there's a big gap between reality and the image." She said Quebecers are wrongfully described in some Canadian media as being xenophobic and racist. "That is not Quebec, we are not like that," Mourani stressed, adding the province's image "has taken a blow in the wake of this clumsily presented charter." The PQ plan will be subject to public hearings before being tabled in the legislature, possibly in a watered-down form. Montreal La Presse reported Friday that several legal experts advised the government this past spring that banning the wearing of religious signs was unconstitutional. But Marois said Friday she believes the plan will withstand any legal challenge. "We believe it will hold water," Marois said while on a tour of Nunavik in northern Quebec. "We are currently in consultations and there will surely be all kinds of opinions from all over, but we think it will hold water." Speaking in Quebec City on Friday, Justice Minister Bertand St-Arnaud initially left some doubt as to the legal foundations of the charter. Later in the day, however, he made it clear he believes the government is on sound legal ground. Mourani has received widespread support for her stance from various circles and on Friday it emerged that ex-PQ premier Jacques Parizeau, the darling of hardline sovereigntists, is behind her. Parizeau's wife, Lisette Lapointe, tweeted Thursday, "We are with you, courageous Maria Mourani." Asked in an interview on Montreal radio station 98.5 FM who the "we" included, the former PQ member of the legislature said a lot of people, including her family. Pressed on whether that included her husband, Lapointe replied "Yes, he's my family." A political foe from Ottawa also had kind words for her. "Although we disagree on many issues, I respect Maria Mourani as a hard-working, principled & passionate Member of Parliament," Multiculturalism Minister Jason Kenney tweeted. "Ste. Margaret d'Youville pioneered health care in Canada: Would she be banned from working in a hospital today?" "Blessed Marie of the Incarnation helped found Canada's 1st school: Would she now be banned from working in a school? Kenney also posted a picture on Twitter showing him wearing a Sikh head scarf. The photo was apparently taken when Kenney visited the Golden Shrine temple in Amritsar, India, in January. A spokeswoman in Kenney's office said the minister considers the picture a "message of solidarity." Kenney said earlier this week Ottawa is prepared to mount a legal challenge against Quebec's plan.